A wheeze of cool air evaporated into the arid desert as Will and Edward stepped out of their time machine, squinting through the unrelenting rays of sunlight that beat down on the ocean of bright red sand surrounding them for miles, completely flabbergasted at the unexpected future they were seeing. A warm wind blew over the sand dunes, bringing with it a thin layer of airborne particles that wasted no time clinging to the exposed skin of the two time traveling friends. Will brushed off his forearms as Will stepped back into the time machine for a brief moment of sanctuary, examining the settings and double checking the condition readouts. “This is 2550,” he confirmed. The bleak, disappointed undertone that crept into his voice was unmistakable. They both took a moment to gaze into the distance. 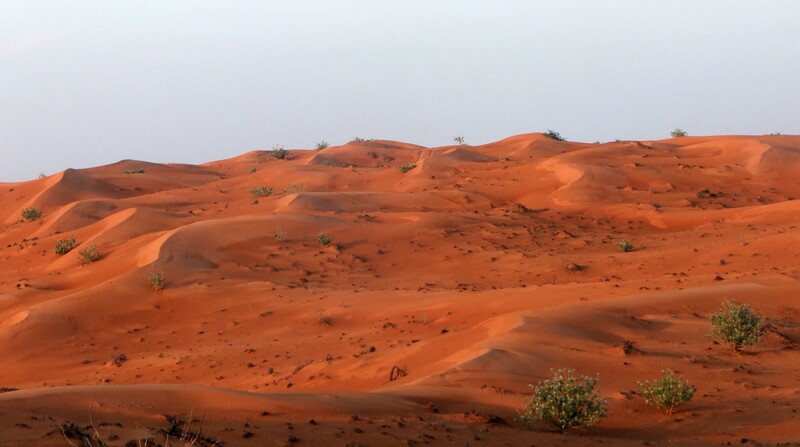 For as far as they could see in every direction there were waves of red sand, and above them the hazy distortions of heat accompanied a light yellow tint to the air that melted into the yellowish blue sky above them, completely devoid of any clouds or streaks in the atmosphere. The sun radiated brightly from behind them, and Edward cringed visibly as he turned to see it, quickly changing his mind with an uncomfortable, instinctive shout. “Nonsense,” Will retorted. “We’re already here, and it has to recharge after each trip, right?” He pointed at the machine behind him, refusing to let his gaze slip away from the limitless horizon in front of him. “That’s the spirit,” Will sang out immediately, reaching down for the backpack of supplies they’d packed before the trip. Edward scrambled to catch up, only barely remembering to stoop and grab his own backpack of supplies before running off after his friend into the unknown, and completely ignoring the comment that would inevitably lead to their next epic adventure… assuming they made it through this one. The sun had shown no signs of slowing its unforgiving blanket of fever over the desert, and while Edward had seen a few scaly creatures scurrying between, through, and under dunes, neither he nor Will had observed any signs that might point to a present occupation of intelligent life in the present, let alone any time even remotely recently. There were, however, remnants of civilizations past scattered among the desert, sometimes buried, sometimes — probably temporarily — unearthed, but always decrepit, defunct, and puzzling: the most curious of which was an abundance of solar panels that seemed to layer the entire desert beneath them, unabashedly revealed in every valley of sand that dipped just barely too deep, resulting in a hard, black surface that the friends refused to walk on, lest it not actually be some solar panels but instead some foreign material with unexpected consequences for resting one’s weight upon it. The panels were interesting, nonetheless, and Will and Edward couldn’t help but theorize at what powers must have been at play to not only fund and direct such a massive feat of technology, but also at what could have possibly let a vast scene of this magnitude wither away into its present, dilapidated state. They’d been walking towards a grand littering of what looked like ruins for nearly an hour, checking their direction in comparison to the potential pocket of life each time they reached a high dune that afforded a view of the alien pieces of scrap protruding from the dunes down in an especially low valley. “I can think of a million ways off the top of my head to wipe the entire race off the face of the earth,” Edward shot back smugly. The sight of a large, red fox scurrying across a dune in the distance caught both of their gazes, and the friends stopped in silence to observe what the closest thing to life they’d yet seen would be doing out here in these harsh conditions. Like everything else in the desert, the fox had distinct differences from what they were accustomed to seeing in their past lives. The most noticeable difference, of course, was its blackened face, blurring its facial features together into an indistinguishable mass of charcoal. Behind that, an extraordinarily long tail flowed in the air behind it as it moved, flopping around as it leaped from step to step, yet never touching the ground beneath it. Unfortunately, the fox merely continued running in its original direction, never stopping to even look around or change its path. “Lets hear it then,” Will said, calling his friend’s probable bluff. “Go on,” Will piped in when his friend paused. Will tripped over a piece of protruding solar panels, broken from years of wear, but caught up to his narrating friend before he could notice. The friends looked around at the arid desert they’d been wandering through and wondered whether these desolate lands had been forged on purpose, on accident, or as a inevitable byproduct of nature; what rate at which the transformation occurred, whether over centuries with civilizations grasping on and on for hope, or instantly, as a result of a meteoric impact by mankind or otherwise; as well as, of course, there was anything a sufficiently advanced society from the future could have done to prevent such a widespread loss of life, land, and prospects. “There’s always global warming,” Edward joked, and they both laughed nervously. It was Edward’s turn to trip over something extruding in the sand, and it wasn’t until Will had fully added, “Maybe the Russians made a hairspray space nuke,” that he noticed his friend’s footsteps had not caught up with his hilarious jokes. “Come on,” he called as he looked back, but cut himself off staccato when he saw his friend violently seizing in the desert sands; his arms flailing energetically but without reason in the air, consequently smashing his hands repeatedly into the dense ground, a bright red pattern of the individual sand’s texture quickly forming on his hands and up his arms; and his head over and over again suffered a similar punishment as a yellow-eyed Edward forcefully thrust the flat of his head repeatedly into the sand, flinging a small cloud of hot powder into the air each time his hair had a moment of rest on the ground between convulsions. A glimmer of something almost like a stream of water through the air, bright blue and flowing, caught Will’s eye as he spoke, and quickly stole his attention from further exclamations, instead flexing and perplexing his mind with logic that made no sense: what Edward must have tripped over was now flowing — no, spilling? — out of the ground and into the air, as if a gas with the looks of a semi-transparent, blue liquid. Instinctively, Will pulled his friend back from the unknown, holding his convulsions tight but yanking him several feet from the being starting to take shape in the air, flying as if by just oozing through the air. Around its perimeter, only visible when it dared to come notably close, animated rings of yellow and orange were repeatedly born to flicker and die out along its surface, giving it the appearance of potentially pulsing with electricity. “Ed, wake up,” Will shouted again, keeping his eyes transfixed on the polymorphic mass now circling he and his seizing friend. Again, the blue mass seemed to dip in closer on the air, until Will shouted again to scare it off. His eyes scanned the ground again for something to throw at it that wasn’t a handful of hot sand, but was again unsuccessful. They reached the metallic construction three eternities later, physical strain to stagger forward accompanied by agonizingly simple questions from a simpling mind, repeated ad nauseum. Will dropped Edward down onto the silver surface, who then immediately screeched and curled over, diving head-first with arms tucked in toward the ground. Dulled from the heat and a headache, Will let his friend fall to the ground without a physical response, until he belatedly glanced down between the structure and Edward, lying down motionless on the ground beneath them. Instinctively he outstretched a hand to the structure and confirmed that it was way too hot to sit on. With a quick crouch to the ground, he hid the silver away with a red color that effectively dampened the heat radiating out from beneath it. “Too hot,” Edward mumbled, then let his head fall between his shoulders, where it rested momentarily before starting to rise and fall with the deep breaths of the newly asleep. “Down there it is, then,” Will said to himself, looking around for anywhere in the ruins of what looked like a small camp that might hold a water reservoir. He spotted a cottage a stone’s throw away and glanced nervously at the blue blob in the sky between it and he. Another glance around the ground was finally prosperous, and he eagerly fingered the panel shard now flitting between his fingers. Will glanced back at his friend, now snoring and slumping closer and closer to the ground, and felt a surge of emotion flow through him, manifesting in another, louder, shout of “Go away!” before thrusting the sharp panel shard in the blob’s direction, passing directly through the lower-left quadrant of it, though it seemed not to notice. The blob remained stoic through Will’s shouting up until the final word, at which it once again began to morph inside itself — generating waves of blue and orange rippling over its body — and flow slowly backward in space, as if drifting away in the greediest of seas. The blob floated infinitely away, somehow seeming to decrease its size in whole as it drifted backward, until it was minuscule enough to blend in with the heavenly skies behind it and disappeared completely. Another glance toward Edward told his friend that he needed to move quickly, and Will sprinted off towards the cottage with overly optimistic hopes that there might be water — or anything even remotely of use — inside. The sun had begun to fall in the sky, having lost its turf to a full moon that brought with it a night of quickly dropping temperatures, and what little win had graced the day with its sandy presence had died off in favor of a complete stillness that permeated the desert with a palpable quietness — aside from Will frantically trying to rouse Edward into consciousness. Ed’s eyes had already rolled back in his head, replacing what had become a disgusting yellow film over his eyes with a fresh area, white with innocence but devoid of pupils. “Ed!” Will cried out into the sky, looking haggardly to the heavens for an answer to why or how this could have happened, already starting to feel the seeds of guilt for forcing the two of them out of that cool metal machine they’d arrived in an unexpected world in. The cottage, like the rest of the structures in this so-called camp, was entirely empty aside from a hilarious number of power outlets and several large batteries jutting out from the walls. There was no water, no first aid, no books to learn from, no communication devices, no medicine — nothing. As he looked over his dying friend, Will began to notice a soft bluish color radiating outward from Edward’s contorted face, a tint that quickly intensified until it covered his entire face and spread out to his neck, his chest, and the ground beneath him. It wasn’t until then that Will thought the color could instead be coming from a source behind him, rather than within his friend, and he turned quickly to see whether he was correct, falling backward into the sand as he found himself face to face with the blue blob he’d scared off earlier, now larger than ever in size and sizzling vociferously with arcs of electricity that crackled and popped in the otherwise silent night. The blob was unphased, and instead continued to ooze into itself, hovering in place several feet off of the ground below. As if managing the weather for its own piece of the world beneath it, tiny bolts of lightning occasionally fell down from the bottom of the blob as if droplets, instantaneously finding a jagged path of white into the sand and then immediately disappearing. Will glanced down from the blob to see Edward laying down on the other side of the creature, completely blocked by an effective electric fence; he called, “Ed,” one more time, but his friend had already stopped the last of what little movements he had been hanging on to. The world seemed to tint blue entirely and Will noticed there were now bright blue blobs floating in from every direction now, coming from inside the structures, beneath the sand, and possibly from above in the atmosphere, if that weren’t too far-fetched. He watched in horror as the blobs wafted closer and closer to where his friend lay motionless, their arrival almost perfectly coinciding with the largest blob’s re-positioning entirely on top of Edward, from which miniature lightning bolt after miniature lightning bolt rained down upon his friend. Will was frozen in place and watched helplessly as the blobs began to float away from Edward once again, leaving only the largest still raining unruly electricity onto his torso. It wasn’t until Edward started violently seizing again did Will break out of his trance and lurch forward towards his friend, who had almost immediately stopped seizing in favor of a cacophony of coming-to-consciousness coughing. The giant blob began to recede into the horizon as well. Will looked up again to check on the blob and was surprised to see it laying motionless in the sand several yards away, almost completely drained of color. A single blob floated in from a structure nearby, and Will realized he may have had exaggerated the changeability of the blobs and mistook the large blob for the one his friend had tripped over, when it almost certainty was this much smaller one approaching. When the small blob was hovering over the large blob, it too began to rain down petite bolts of lightning from its underside, though the colorless blob beneath it refused to stir.